This fall, Bike Club is back. This after-school, bike safety education and earn-a-bike program for 9-12 year olds will return to Harvey Scott School next week. We’re also extremely excited to offer our very first Bike Club at Rosa Parks Elementary School this season. Rosa Parks is located in the heart of New Columbia, right across the street from the Bike Repair Hub and the new Skills Park. It’s a great opportunity to connect the kids from Bike Club with our We All Can Ride bike committee, and pilot new programming with the bike amenities in the neighborhood. 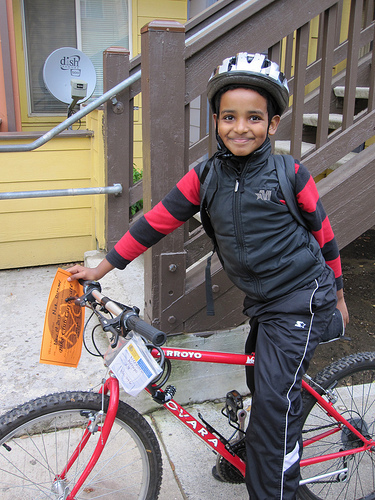 In celebration of Bike Club season, we met up with Nur, a former Bike Club participant at Harvey Scott School. 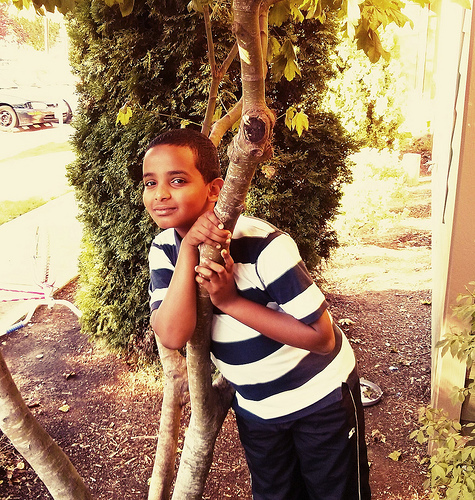 Nur shared with us his favorite memories of earning a bike through Bike Club last fall. When did you earn your bike? I earned my bike when I was in 4th grade but now I’m in 5th grade at Scott. It’s a red bike, it has a water bottle place, it has gears, and it goes backwards. What was your reason for joining Bike Club? I didn’t have a bike and my friends told me that if you go to Bike Club, you can learn a lot of stuff and you can get a bike. Do you remember your instructors at Bike Club? Joseph and a girl with dark, curly hair…Stasia! There were two of them. The first day of Bike Club, we colored a big paper and we wrote our names. We played the helmet game with the eggs where we wrap them up. We were riding bikes on the street with [hand] signals and all of that. If your tire pops, they give you tools. On the second to last day of Bike Club, you take air out of your bike tire, and the first thing they teach you, you have to fix it by yourself or with a partner. What fun things did you do in Bike Club? My favorite thing was riding bikes on the street. I had my friends that were in my class. I rode my bike a lot of times. My best time at Bike Club was when I had the first aid kit when we were riding our bikes together. After Bike Club, where did you ride your bike? My house, the park…you know that park past 42nd? Fernhill Park! What are you able to do with a bike that you couldn’t do before? I didn’t know how to fix a bike. I didn’t know anything about bikes. You know some people don’t know how to ride a bike? When you had a bike, who did you ride with? My mom. You know, you can get your car and a hook for a bike to hold on to the bike. We have one of those, and then we just hooked it up. We went in the car to the park and then we took our bikes off and then we rode bikes in the park. Why do you think bikes are important? Because if you don’t have a car. Bikes can make you exercise if you pedal. You can ride it if you’re bored. You can do a lot of stuff. You can go to the store. Why do you think Bike Club is important? You can learn a lot of stuff. If you don’t know anything about bikes and you went to Bike Club, you can learn a lot of stuff and they give you a bike and they teach you how to fix a bike and all that and that’s good. And it’s cool. Thanks for sharing your memories of Bike Club. Tell us about your favorite subjects in school. I like writing because I like to move my hands. I love art. I love math because math makes you smarter. In my grade, we do a lot of math – one math class in the morning and one in the afternoon. Thank you to all of our supporters who have helped make Bike Club possible this fall, including our business sponsors: Moda Health, Albina Community Bank, Stoll Berne, and Kittelson & Associates.